There are places on earth you never think you'll visit. You see them on the telly, you coo over photos in the 'Sundays' magazines, you glance surreptiously at guidebooks about them amongst guidebooks of more sensible and economically viable places that you are actually travelling to, but you NEVER think you will find yourself there. Never. For me the Galapagos was one of those places. Four years ago or so I watched (with dinner on my lap and a lump in my throat) the lush and wonderful BBC series on the Islands. It was magical. The swirling overhead photography of those volcanic outcrops bursting audaciously out of the sea, the glorious underwater footage of sealions and whales, the fabulous images of creatures weirder than imagination could create all accompanied by the honey dripped tones of Tilda Swinton (who sounded as if she was eating the islands rather than narrating a documentary about them) seemed all about a place so remote and extraordinary that I imagined I could only dream of going. At that point I had a rather tenuous grip on geography and so it made sense that I imagined all I could do was dream. I thought the Galapagos islands were somewhere completely unreachable way off the bottom of South America, attainable only by a boat that went there once a year and which took about three weeks to arrive. I really had no idea that there were very regular one and a half hour flights from mainland Ecuador and that lots of people visit all the time. Then my hurriedly bought bulk-Amazon-guidebook-parcel arrived. I pulled out the guide to Ecuador and lo and behold it included a section on the Galapagos. And then I actually looked at a map. And then a little plan started to form. And then I got excited. And that excitement carried me up the harder biking stretches of South America. Because we were going to be going very close indeed to those islands. So close in fact that we could perhaps hop on one of those two-a-day flights and really and truly go there and visit the islands ourselves. Now, if I was a scientist I imagine I might have been able to approach the whole enterprise with the sort of calm exhibited by Darwin when he vsited back in 1835. He 'worked hard' in the Galapagos when the Beagle docked there to pick up tortoises for long term lunching on the return trip to Europe. He, the second choice naturalist for the voyage, gathered specimens of 'every plant which I could see in flower' and made his now famous oberservations about Finches and their beaks and eating habits which eventually contributed so heavily to his theory of evolution. However, I am not a scientist and so my approach to the islands was not one of earnest scientific anticipation but one of extreme internal jumping. Once we decided to go, and booked the flights, I was so excited it was untrue. And I was quite right to be. From the minute our plane started descending and broke through the cloud to reveal the islands, to the minute (face pressed to the window) the cloud closed back over them and we flew away, it was one of the most amazing experiences of my life. The wonder starts when you first see the islands. They are just sitting there in a the middle of the ocean. They seem so small and unlikely and tenuous it is hard to imagine anything exists on them at all. They are little bits of land that don't look big enough to survive the perils of the endless sea around them, let alone manage to allow a plane to land and dispense a cargo of tourists. Where are they all going to go? Well their choices are limited since there are not many places to go. In fact, there are not many 'places' at all. Many of the islands are completely uninhabited and those that are, are only so in the most minor of ways. In the main tourists head almost immediately onto touring boats. From there they briefly land to investigate these tiny chunks of terra firma or jump into to the water to explore their surrounds. What built structures do exist are very simple and low key. The airport is small. You walk across the tarmac to a mini terminal with no real enclosed space. There your luggage is unloaded in front of you and you stroll around to find it before boarding one of a few buses that take you on the five minute trip to the ferry connection to Santa Cruz island where most boat tours begin. Nature dominates and what is constructed is all very open and all very accessible. This openess and accessibility is true of the whole experience. From the moment you arrive you have access to the natural world in an unprecidented way. It feels like arriving on earth before the rest of humanity turned up. The first creature we saw was a Blue Footed Boobie, flying about near the ferry. A Blue Footed Boobie. It is a thing made up in a dream. A beautiful bird with bright blue feet. Big, webbed, bright blue feet. Seconds later a sealion reared its head in the azure clear water, gave us a little look and then swan on. Glancing at the rocks we saw crowds of vibrantly orange and red crabs sitting pretty or skittering about. And so it went on. The plant life was strange, the geology was strange, the wildlife was strange. We also decided to begin our stay in a strange way. We didn't have a planned tour. We weren't met at the airport by a tour company. We got on the local bus with a few of the island residents, took the one long straight road across Santa Cruz island and headed to one of only two serious sized settlements. And there we stayed for a night. It was fun to be amongst those who make the Galapagos their home. It is a funny old place to live, remote and unusual. There are not many places on earth where the pavement can be blocked by a sealion or the roadside littered with pelicans. In the hotels in Puerto Ayora you may find your guests in the swimming pool or you may find some ducks and herons are taking their turn. We took a stroll to the pristine white sands of Tortuga Bay and the local joggers who plyed the route had to dodge basking lizards and pottering birdlife alike. Because the animals seemed utterly unconcerned by the presence of humans. Isolated for so long, creatures here have not developed much of fear of them. It is said that in the Galapagos you have plenty of time to kill a fly because it won't be alert to you coming. Darwin thought the birds 'silly' since they were so unafraid he could just pick them up to finish them off. This unique situation is what made us gasp time and time again. We were sometime milimetres from animals, able to touch them we were so close. We never did though, since that is the deal here. You can come and see the nature but you must try not to interfere with it. And so you come across one of the conundrums of this place because for some people it is home. When the first humans settled they brought the obvious things to the islands like cows and goats, cats and dogs and these introduced species, and the simultaneous killing of endemic ones for food and survival, has wreaked havoc on some of the islands. Over 100,000 tortoises were killed in the nineteenth century. They were fantastic grub for sailors since they could survive without food and water on a boat for a year. Darwin himself ate them. People were not aware of the environmental outcomes. The current population of thirty thousand is rapidly growing. It is where they live and work and play. Many would rather not have to imagine they live in a museum and be limited in their activities by a constant awareness of their impact on the natural world. We heard a fair bit from the naturalists we met about a clash of idealogies. There is a lot of research activity there and a National Park program and those it employs are working hard to rid some islands of introduced animals and to instigate breeding programs for decimated native populations. They don't want the human population with its modern demands to grow. Here you have to put those demands aside. If you want to park your car you can't barge a sealion out of the way. You have to park somewhere else. Preserving the emptiness is hard. From populated Puerto Ayora we planned our visit. I decided to head out on a boat for three days and Phil decided to get to know the islands from one base. And both our experiences were fantastic. I loved being on the water, seeing one island disappear and another approach and he got to integrate himself further with that conundrum way of living, cycling around the island and sitting by the waterside communing with the fabulous creatures also making it their home. And boy did we see some fabulous creatures. Marine Iguanas in lazy piles exercising their salt spitting habits, Frigate Birds with their puffy red chests, the Galapagos only Waved Albatross nursing its young, Sally Lightfoot crabs vying for rock spots with Hermit Crabs, the Blue Footed Boobies doing their mating dance, the Nazca Boobies their more glam looking cousins, Marine Turtles gliding slowly under the water, baby Sealions flapping about learning to use their limbs, Lava Lizards exercising their press up muscles, Penguins, Swallow Tailed Gulls, Mockingbirds, Finches, Flightless Cormorants, Giant Starfish, Giant Tortoises, Sea Cucumbers and on and on and on and on. Creatures that fly, creatures that don't, creatures that swim, some that just float...animals over one hundred years old, some that were only one day old...some nesting, some resting, some crawling, some sprawling...mammals, reptiles, insects and molluscs...on and on and on. We gazed at spotless white beaches and wild rugged lava flows, at Mangrove trees and at Hibiscus flowers, at crystal clear water and at bright blue skies and then at dark rainy skies and angry swelling sea. I swam with playful sealions and turtles, Phil biked with plodding tortoises. We saw so much it was quite overwhelming. And we both made new friends in our different locations. I enjoyed the company of my companions on the expedition boat. It was inevitable that we would bond quickly, glued as we were by the urge to ooooh and aaah and to say 'quick look over here'. Phil met some great locals and had breakfast in an Galapagon home. And I saw some Whales. This was a moment that was quite other worldly. It was hard on this visit to keep reminding yourself that it was real. We have seen so many images on television, watched such extraordinary footage that sometimes it feels as if you are still at that one remove. You half expect the dulcet tones of David Attenborough to penetrate your mind. Our little snorkelling group was heading out from the main boat when our guide saw a gathering of seabirds circling the water. We had been looking all morning for Whales and had seen a few at a distance from the boat and she suggested this might be some more. So our dingy driver revved the engine and got a bit closer. And then we started to look. We all leaned towards the edges of the boat and scanned the horizon. We looked and looked and looked and leaned and leaned and leaned and chatted and commented and surmised and then......screamed. The front of our boat lurched up as an Orca Whale dived right beneath us it's huge black back fin splashing us as it dived. 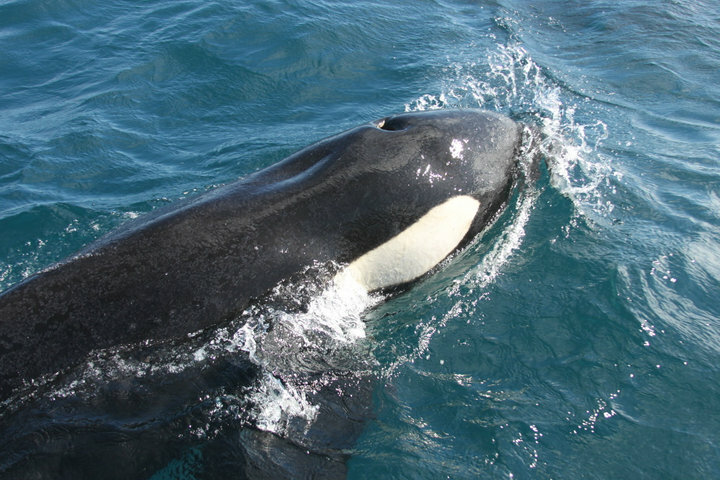 An Orca Whale. Better known as a Killer Whale. And then began an amazing half hour. Orcas live in pods and we had come across a family pod teaching a young one to hunt. Its prey was a truly weird Sun Fish, a creature that is pretty exciting in its own right. The other small boats from the main boat gathered and we were treated to a proper BBC nature program display. The Whales arched up and dived, they blew shoots of water up into the air and they showed off their proper Killer Whale fins to our arm-pointing delight. They swan all around us and under our boat and we saw them whizzing along at incredible speeds as they played with and injured the Sun Fish. In the air a huge gathering of sea birds waited for the spoils and in the boats we all watched in awe. When the Whales finally moved on we were all left in gabbling silliness, repeating the experience to each other endlessly, laughing and then gabbling some more. Our guide was ecstatic. In eighteen years of working on the Galapagos she had never seen anything like it. We were so lucky. That feeling never went away. That night as we drank wine as the sun went down just as we crossed the Equator all the talk was of the Whales. And all the other things we'd seen. We looked at each others photos and shared email addresses to send them on. We were high on the natural life we'd witnessed. And for Phil and I that feeling has lingered. Cliche-aware we are both looking at nature differently. I want to know what every bird is now. The Finches that I became so obsessed by on the Galapagos are small, boring looking birds until you know just how significant they are. Now, nothing seems boring. Flying away it was odd to think that we were going and leaving all that vibrant life behind. They were just going to carry on, exactly as we left them. I found the same every time our small boat left an island and headed back to our floating home. The sun would be going down and the animals and plants would have their dominance once more. There are places on earth you think you'll never visit. And there are those that it's hard to believe you ever really did.